A few weeks ago when I considered booking this weekend trip to Seoul my ears perked up when the travel agent mentioned a tour to the Demilitarized Zone, or DMZ. I never realized that I wanted to see it until that moment. So this morning we met our tour bus, passports in hand, and headed out. After World War II Korea was divided between U.S. and UN Command in the South and Soviet protection in the North. South Korea declared independence in 1948, followed by North Korea shortly after. Tensions between the two exploded into the Korean War between 1950 and 1953. At the war’s end a hard line between the two nations was drawn: the Line of Control, with its surrounding four kilometer buffer zone called the Demilitarized Zone, or DMZ. An armistice to end the war was signed by the Chinese, North Koreans, and UN Command. The South Koreans refused to sign, so technically both countries are still at war and merely observing a cease fire–the longest deadlock in military history. Back to today’s tour. Our tour bus left Seoul and headed north. 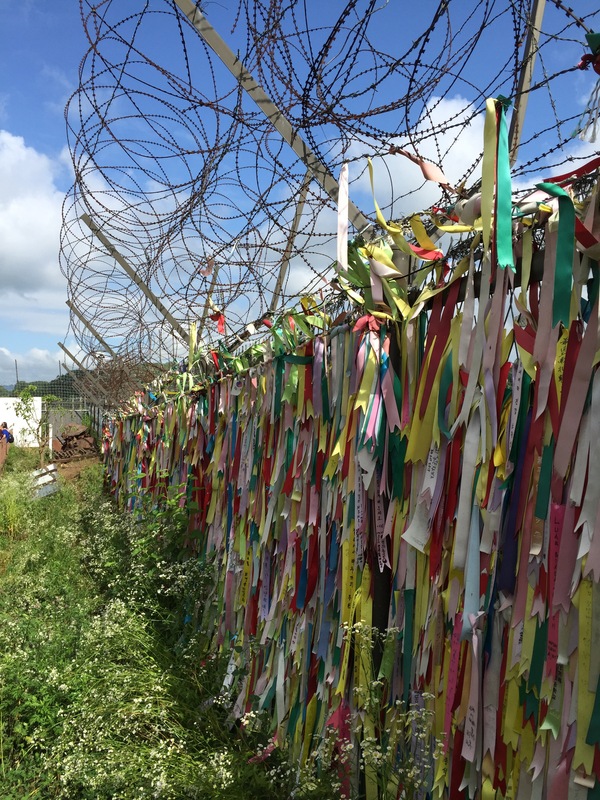 The suburbs of Seoul quickly gave way to lots of barbed wire and observation posts on the banks of the Han River. 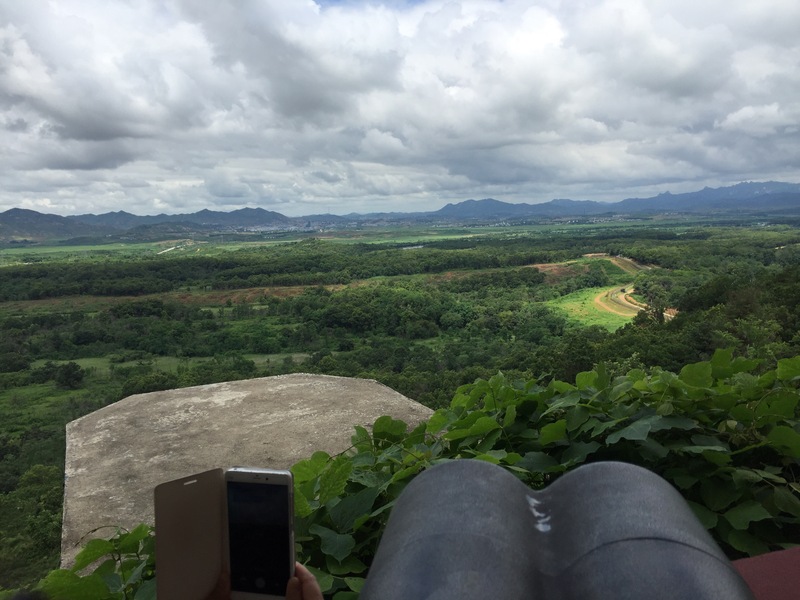 Though we were still a ways from the DMZ itself, soldiers stood guard with weapons trained. 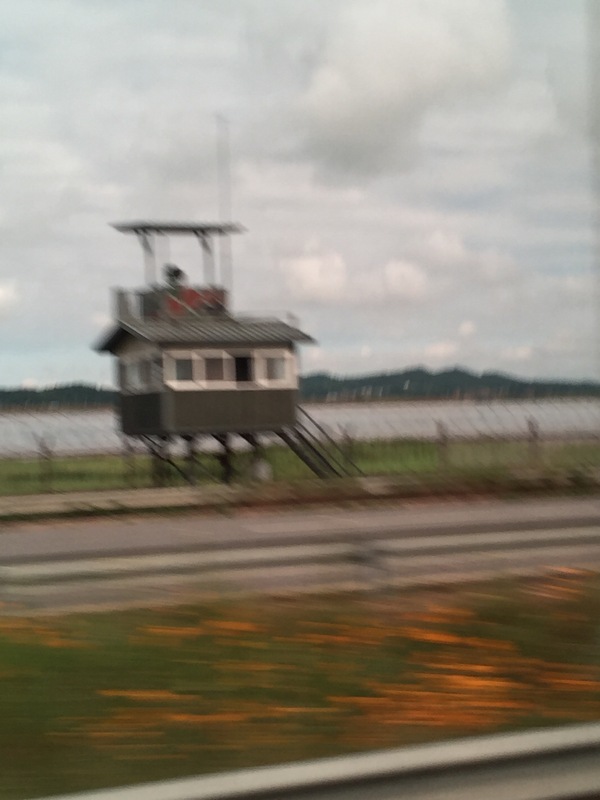 Right after I snapped this blurry shot of one such watch tower from the bus we were told not to take pictures from the bus–so apologies for not trying for a clearer shot. 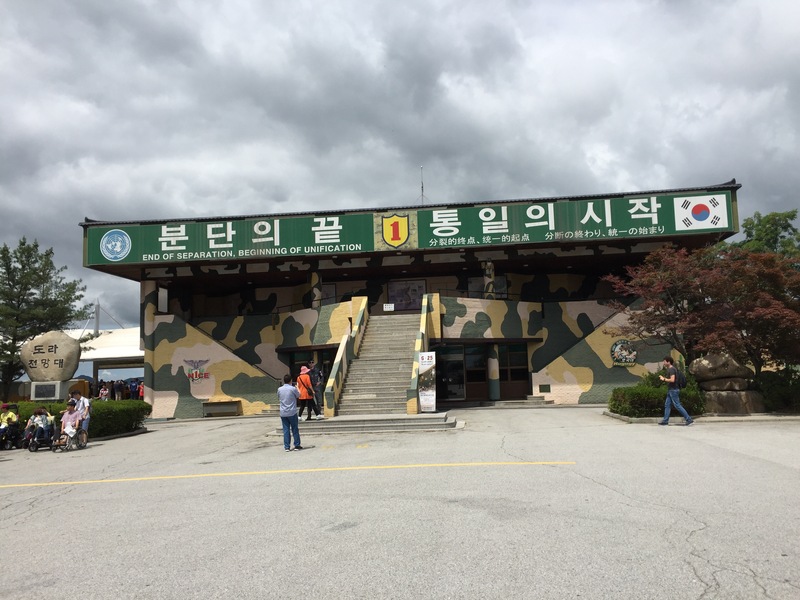 The somber environment–and tons of barbed wire–along the drive to the DMZ gave way to lines of buses, mobs of tourists, and oddly cheerful souvenir stands and snack shops once we arrived. It was just so…odd. 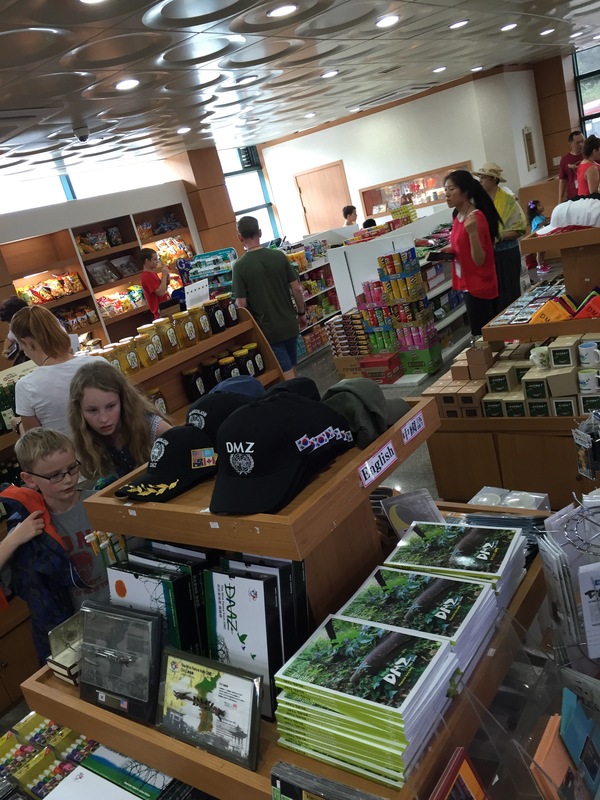 Mark described our standing there as more dangerous than a volcano that’s about to blow, and here we stand gaping at the North and buying tacky DMZ souvenirs. 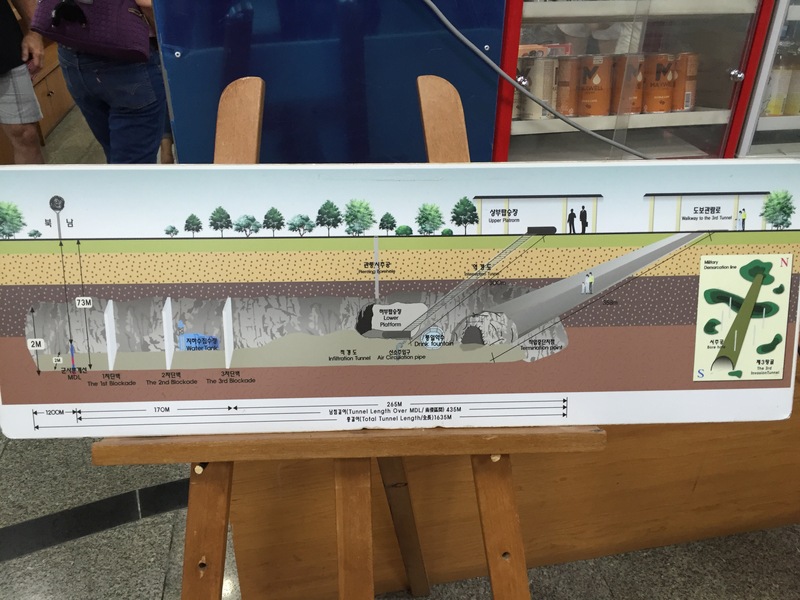 Over the years the South discovered several tunnels from the North to South crossing under the DMZ. Our first stop on the tour was to one such tunnel, called the Third Infiltration tunnel. It measured not-quite 2 meters in height, which meant hunching over and occasionally whacking a hard hat-protected head on the pipes overhead. We walked along the rough walls blasted from rock and stopped just short of the Line of Control. Three walls of concrete seal the tunnel, and small windows in the first wall allowed us to peek through to the next gap. 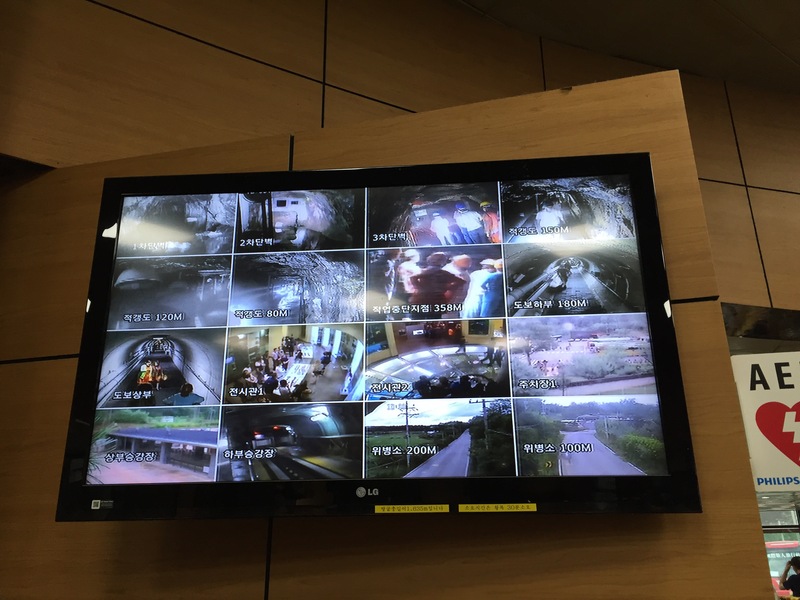 Photos inside the tunnel itself were forbidden, but this shot of the various cameras inside the tunnel shows our journey. The next stop was Dorasan Observation post. Think of places like Niagara Falls, the Grand Canyon, or anywhere else with binoculars that require a coin to operate. 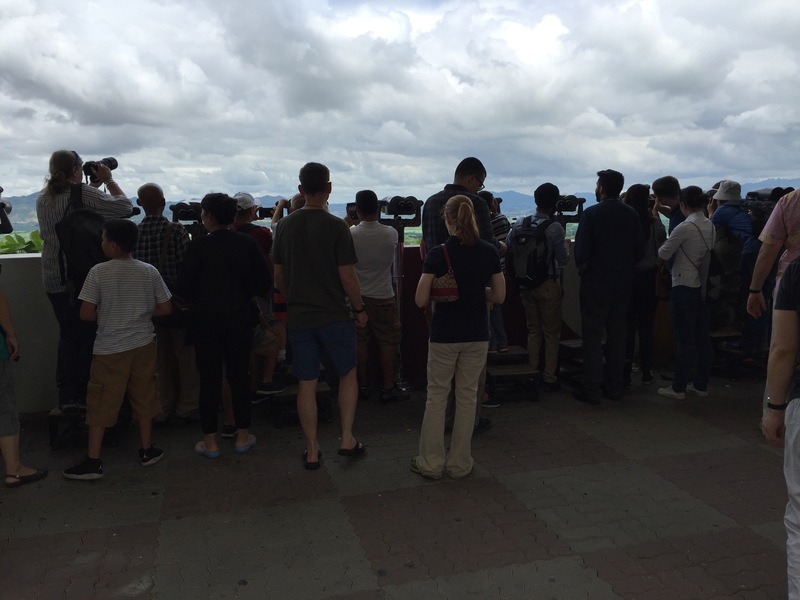 Dorasan is just like that–only with a view into North Korea and the famous Propaganda Village filled with crumbling buildings to show the South what they’re missing. Propaganda Village also features the largest flagpole in the world. North and South take turns building taller and taller flagpoles, and the North currently has the lead. 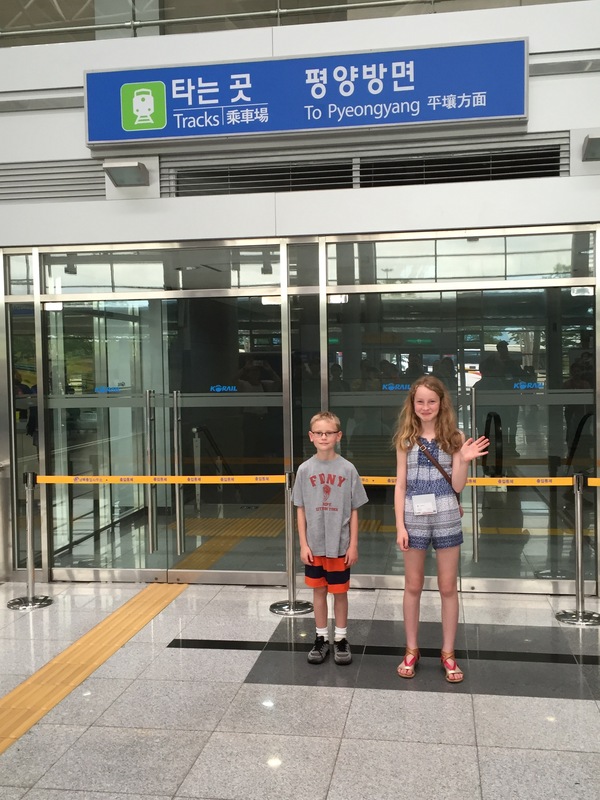 After Dorasan Observatory we headed to Dorasan station, a train station opened to cross border train traffic in 2007. 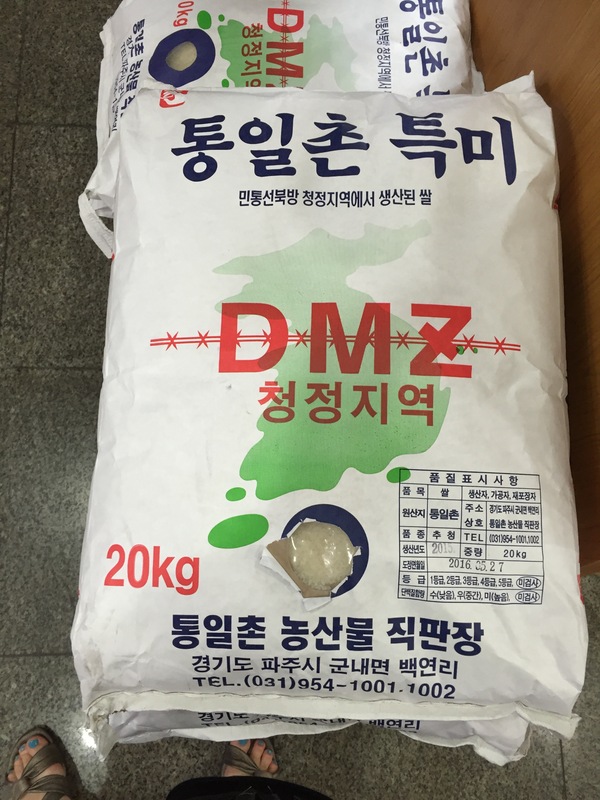 Raw materials went from the South to the Kaesong Industrial Region in the North; finished goods then returned South. The arrangement lasted less than a year when the North called it off in 2008. 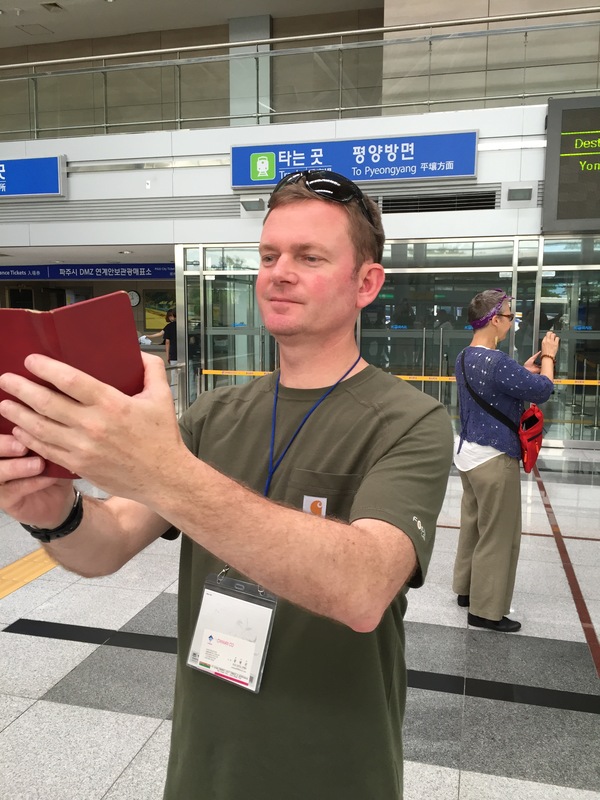 The station remains in use with a handful of trains per day ferrying tourists back and forth to Seoul. 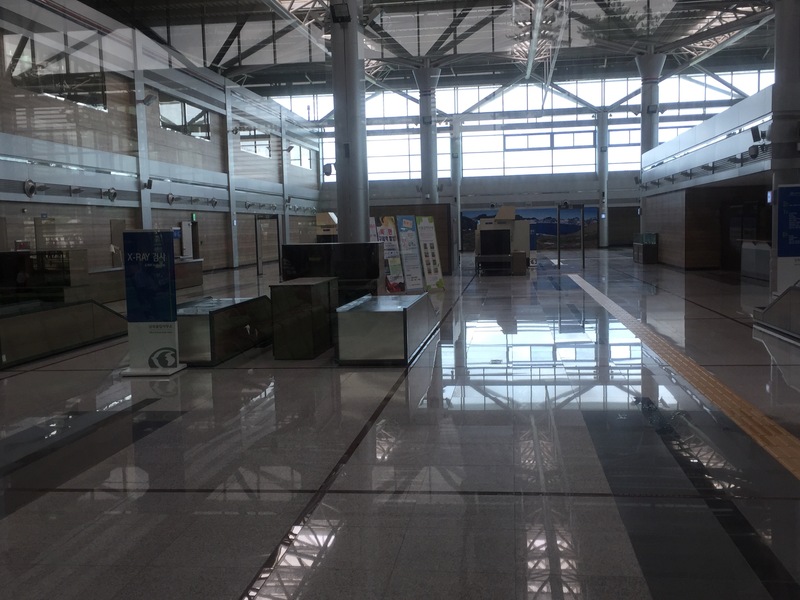 The customs and immigration areas sit empty, and the To Peonguang sign leads to blocked tracks. 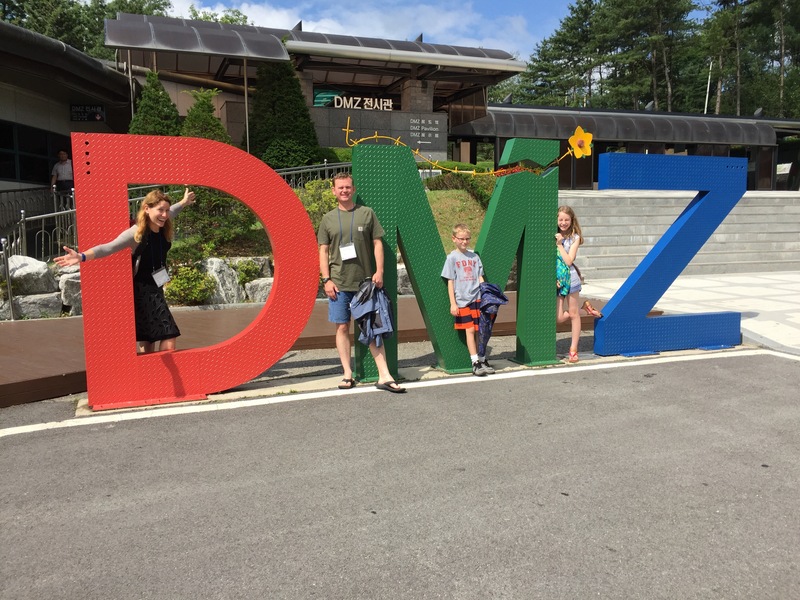 The propaganda machine of the North certainly takes the grand prize–but frankly I found the spin in the various DMZ exhibits a little heavy handed. The outlandish behavior of the North speaks for itself, such as the mere existence of the numerous infiltration tunnels. So the introductory movie at the Tunnel showing repeated, simulated Arrows of Death and Destruction obliterating Seoul? Perhaps a wee bit of overkill. 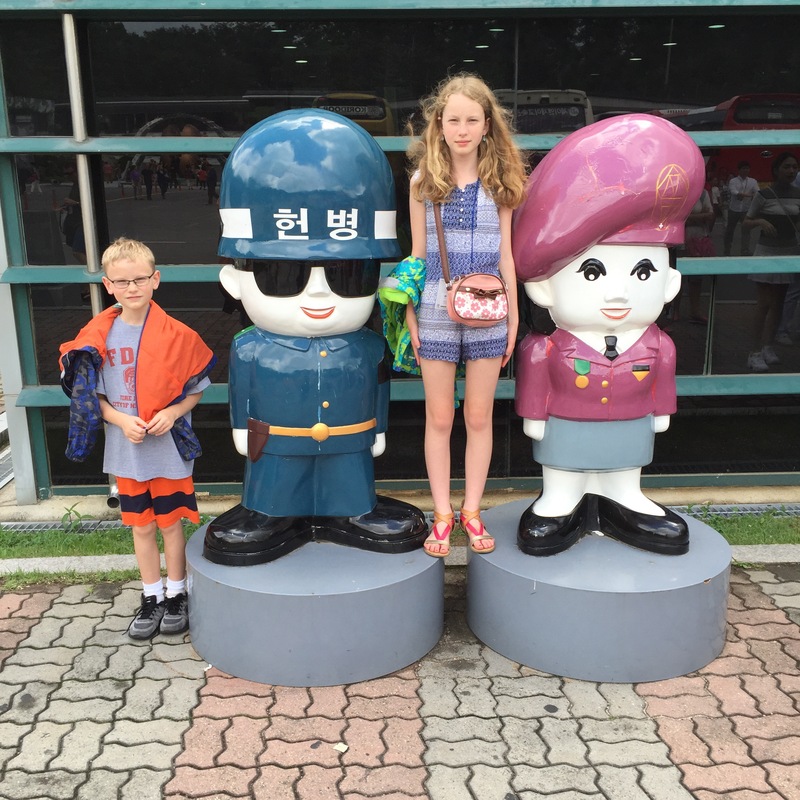 We did not have the chance to visit the Joint Security Area, or JSA. This is the only part of the DMZ where South and North soldiers stand face to face. Remarkably, the travel agent here offers JSA tours, but alas–our youngest does not meet the minimum age requirement. Maybe next time. The experience definitely left we wanting to learn more about the Korean War and the current tensions. On tomorrow’s schedule: a palace visit and martial arts comedy show.